(Release Date: March 11, 2014)  Working from Sylvester Stallone's original script, director Gary Fleder's "Homefront" is what one might called a meat-and-potatoes movie. The actors are perhaps far better than the B-level premise, but they also help the film to very nearly transcend its straightforward, somewhat exploitative intentions. In one of his most down-to-earth roles, Jason Statham plays widowed father Phil Broker, relocating to the New Orleans area after putting his dangerous work as a DEA agent behind him. Two years ago, he was responsible for the death of a biker gang leader's sonthe major deciding factor in wanting to get out of his profession and keep safe 9-year-old daughter Maddy (Izabela Vidovic). When a schoolyard scuffle ends with Maddy bloodying the nose of a bully, it is the catalyst for a downward spiral of harassment and revenge perpetrated first by the young boy's drug-addled mother, Cassie (Kate Bosworth), and later her meth drug lord of a brother, Morgan (James Franco), and his girlfriend, Sheryl (Winona Ryder). With the town sheriff (Clancy Brown) unable to do much of anything about it, Phil has no choice but to take the law into his own hands. "Homefront" traverses a pretty basic plot, but delves into some intriguingly muddy waters as the characters reveal themselves to be far more than one-note heroes and bad guys. Jason Statham, James Franco, Winona Ryder and newcomer Izabela Vidovic are all effective in their parts and bring more to the table than what the screenplay calls for. Kate Bosworth's scarily believable portrayal of a white-trash mother, however, is the most valuable player, her character's vindictive outlook a distinct outcome of a life unraveling through addiction. Bosworth's Cassie is positioned as a villain in the first act, but where she ends up is not at all where one would have imagined. Story contrivances run throughout, to be sure, and there are no themes running any deeper than what can be deciphered from the tale's surface. 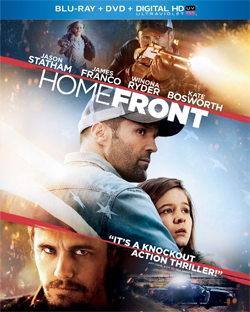 All the same, "Homefront" is dynamically directed, legitimately suspenseful as the climax plays out, and consistently captivating for all 102 minutes. There isn't a single criticism to be made of Universal's dazzling 1080p digital transfer of "Homefront." From the opening aerial shot filmed at dusk, the picture immediately impresses, every last car headlight and texture of the bridge and buildings alive with detail and exhibiting no signs of aliasing or banding. Things consistently remain demo-worthy thereafter, its every image popping with vivid color and dimensionality. Blacks are always inky. The smallest of lines on faces and clothing are terrifically resolved. Watching the Blu-ray, one can practically smell the sweaty, swampy surroundings of New Orleans and its surrounding backwater Louisiana locations. The DTS-HD 5.1 Master Audio is very nearly just as excellent as it bursts out of the gate with all cylinders firing. Channels from the front and back jolt and thunder in a very natural, immersive, blessedly lossless fashion. Dialogue and music are robust and always one with the other active action-oriented sound effects. Simply put, it sounds great. Universal's Blu-ray release of "Homefront" is skimpy on bonus contentan audio commentary track with director Gary Fleder and/or screenwriter Sylvester Stallone would have been fascinating and welcomebut instead all consumers get is a brief EPK and a few deleted moments and scene extensions. Where the disc excels is in its spectacular visual and aural presentations, which could scarcely be better. On top of that, the film is a solid action-drama featuring a top-notch castthis is one of Jason Statham's more humane performances in memoryand enough tension and fireworks to please its target audience and beyond. "Homefront" in buzz-worthy high-def? Yes, please. Recommended.